The ritual continues. Because most of the tables are quite busy at this, and at any, time you climb the almost spiral staircase, careful not to spill the hot beverage. Once upstairs, you walk in between tables with the same care, while also hunting for a free spot. It is hard to divide your attention. It is very hard. It is hard because it is also dangerous. To convince you that this is not a commercial: our fellow student and blog writer Jelena burned her arm quite badly a couple of years ago while walking upstairs, carrying a glass of tea (luckily, she seems to have a healthy attitude towards the Sankt Oberholz mark). Finally, you feel like a hero when you find a free spot at a table, which you now share with some other 5 or more people. The next step is to locate the extension cords under the table (they are, luckily, ubiquitous, but, unluckily, dusty and crowded with plugs of all species). Here, upstairs, besides the dominant population of Mac users, you can find some people with books. Around, a lot of work meetings, a lot of Skyping. Facebook-flâneurs. It is not surprising that the place looks like a field of laptops (imagine a field of solar panels) rather than a café. 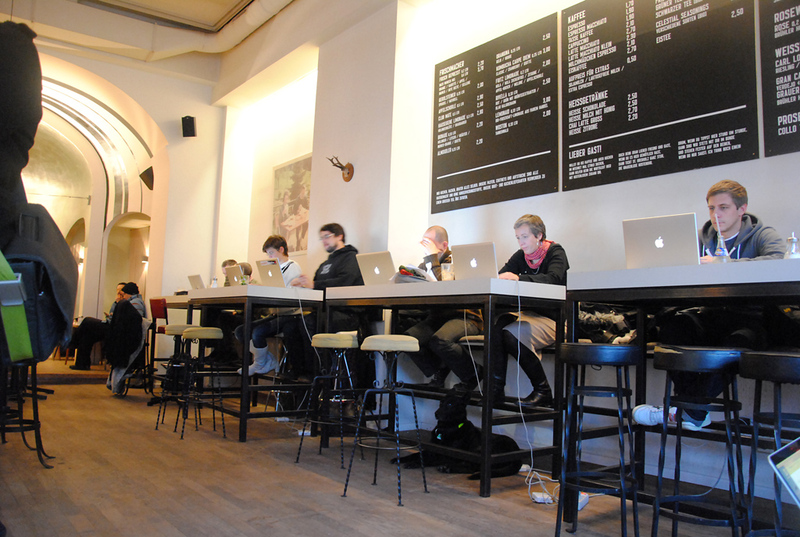 Sankt Oberholz was one of the first venues in Berlin to offer free WiFi. And it worked – tourists, expats, coffee addicts, laptop owners of all kinds gathered like bees to honey. Generally, it is thought of as a very hipster, very techie place. But, again, there is some irony and humor in the way Sankt Oberholz treats its not being quite a typical café (and it is perhaps this that makes it feel so hipster). I already mentioned its humorous attitude towards commerce; I can only add that a typical bill from Sankt Oberholz quotes the title of a webcomic by Sarah Burrini: “Das Leben ist kein Ponyhof” (“Life Ain’t No Ponyfarm”). And, even though minimalistic, the café has some eclectic elements which read almost like a comment on the too eclectic Berlin cafés. For instance, nothing connects the neatly printed menus on the walls on the ground floor with the bizarre bathrooms upstairs, where one can find awkwardly shaped yellow soap on a stick (apparently, a Korean invention), while an absurd radio station plays in the background; nothing but a staircase. The café also has a funny website on which they post, among other things, pictures and descriptions of the objects lost/found in the café. One entry in November 2012 begins: “Somebody forgot an inscribed napkin. The napkin is 16 x 8 cm. It looks exactly like those napkins we use at the café. Somebody wrote on it, “1745772xxx for the cute bartender with the black shirt.” […] We don’t know when this napkin was forgotten, maybe last night already. Since then we had three cute bartenders with a black shirt working”. I have been trying to look for a rational explanation as to why, in some historical periods of ECLA of Bard’s existence, Sankt Oberholz has been the alternative reading room. Nay, the alternative ECLA – students and sometimes professors seemed to be able to spend days in a row in the café, feeding on nothing but lattes and cappuccinos while reading or writing. But, besides the fact that it was indeed a good place to work, there seems to be nothing else. It also didn’t seem that we really fitted the place: e.g. many of us are devoted users of PCs, not Macs; also, we perhaps do read old stuff, but not ironically, not hipsterly. Yet somehow the place fitted us. At the distance of some 25 minutes by the M1 tram, Sankt Oberholz was just there. Not a hidden café, not eccentric––just a very large, free WiFi café. At times it was quite amusing: sitting there, meticulously reading your Aesthetics Reader brick, when all of a sudden a fellow student arrives, as if from a parallel world; as if you haven’t met one hour ago on campus. It was not as if Sankt Oberholz became the other ECLA; it was as if the ECLA’s bubble extended to swallow all of Berlin. Experience shows that the percentage of Sankt Oberholz–addicted students at ECLA of Bard has dramatically decreased in the last couple of years; so has the average time spent in the café. It is not that no students ever go to Sankt Oberholz; a couple of weeks ago, when I went upstairs to look for a place, I saw a Cambridge edition of Rousseau on one of the tables; the owner was missing, but there was no doubt it was an Eclerian. However, overall, things are bad. No, the café does not mourn, it is as successful as ever, but that is perhaps the very problem. Be that as it may, I personally still go to the café from time to time, even though, at this point, out of sheer habit and for the sake of old memories. There is, already, a familiarity that asks for no rational reasons. I find it hard to imagine living in a city that has no Sankt Oberholz. Before leaving Berlin for a longer time, I go to Sankt Oberholz; upon arrival I do the same. I sometimes feel like the last devotee of a disappearing cult. At least I know I am not the only clinical case, so to speak. If you become a faithful client, you will notice that there are, among the clients, faces that you see more often, faces on duty. No doubt, for them, you are a face on duty, too. In 2012, I kept noticing a man in his fifties who always had some sketches, books, strange objects and wires on his table. It seemed that he was always engaged in some meticulous planning, but it also seemed that he was planning something different every time. One time I was able to guess, from the movement of his hands, that the drawing was rather abstract; another time, I saw him copying with incredible precision a technical drawing from a book. He was always trying to hide what he was doing, although he was sitting at the most conspicuous table on the upper floor. The painter was only one of the many characters of this nomadic, fluctuating family at Oberholz. But this is not the end of the story. One day I was in the café with Jaime Groetsema, at that time editor of this blog. The painter was as usual in his corner, meticulously working on one of his secret creations. Nothing special up to this point. Gradually, we realized that what the painter was making was actually a mini sculpture. I also couldn’t help but notice that he was frequently turning in our direction. He was quite nervous. Alas, I told Jaime, not without concern, that “in this very moment he is making a sculpture of us!” What does one do in such instances, does one feel offended or rather pleasantly surprised? Does one leave, leaving the sculptor with no models, or does one patiently wait? We were baffled, but continued our conversation. After 20 minutes or so we decided to discreetly make our escape. When we were passing by his table, he brusquely extended to us the tiny sculpture. His hands were dusty-white and on his palm the joined figurines looked like two tiny snowmen. A miniature Aurelia and a miniature Jaime, bent over a minuscule pile of books. We had to take it, he insisted with a few suggestive gestures and no words. So we took the little wonder. They kept reading––our doubles––their chalk Republics, their dusty Poetics, as we walked out into the cold evening. On the M1 already, I noticed some minute letters scratched on the cover of the teeny book on top of the miniature pile. It said: All Eclerians’ roads.